Levi Strauss had the canvas made into pants. Miners liked the sturdy pants but complained that they tended to chafe and the canvas material never became soft and comfortable. Once the supply of canvas was gone, Strauss began using a thick fabric made in the French town of Nimes known as serge de Nimes. This name would eventually be shortened to denim. Work pants made of such material were not new. It was the use of metal rivets that turned these pants into what we now know as jeans. Rivets were not the idea of Strauss but one of his regular customers, Jacob Davis. A tailor, originally from Lativa, Davis had a client who was consistently ripping the pockets of his pants. One day when looking for ways to strengthen the pockets, Davis had the idea of adding metal rivets to the point of strains including the corners of the pockets and the bottom of the fly. These new pants were an immediate hit. Davis was afraid of someone stealing his idea and decided to apply for a patent. He did not have the money to do so and thus needed a business partner. Jacob wrote a letter to Strauss suggesting that they apply for the patent together. Levi saw the potential for this new product and agreed. 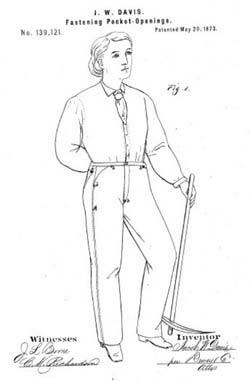 On May 20, 1873, patent no.139,121 for the “Improvement in Fastening Pocket Operative” was awarded to the two men. Strauss hired Davis to manage the production of the pants at the San Francisco plant. In 1873, the first riveted pants were made at this plant. These riveted pants were an instant success. Working men from all over were buying this new garment because of its durability. In 1885, a pair of Levi Strauss blue jeans cost $1.25. 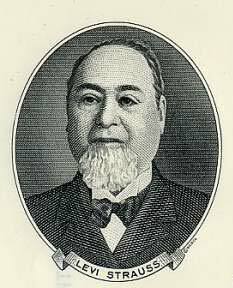 In 1890, the Levi Strauss Company began assigning garment numbers and blue jeans were given the number 501. A truly American fashion trend, today Levi’s and other blue jeans are worn by people all over the world.